After watching the programme “My brother the Islamist” i could not sit back and do nothing. i was itching from the moment the programme finished to write a review and express my view and as i believe the views of majority of the Muslims. For those who don’t know or have not heard anything about the much talked about programme aired on BBC 3. Do a simple google search and you will find out immediately. I’ll mention it briefly anyway, the programme was about how some new “convert” Muslims end up on the extremist side of Islam. How the life once they lived and loved, is completely shunned and detested, at most. 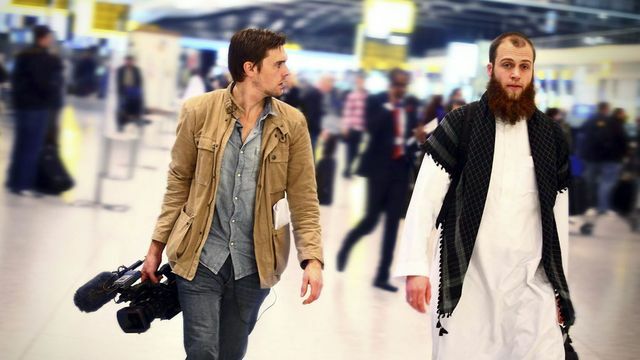 On this particular programme you had your average “western” “white” boy as the producer of the documentary covering a story where his step brother converts to Islam and ends up converting to the extreme version of Islam, basically the HTs (Hizbut Tahir), or Islam4UK as they call themselves now. His step brother named Saladin AKA ‘riche’ then goes out recruiting other new muslims so to speak, of joining the HTs. Saladin finds a young, naive 17-year-old – (whose name i have forgotten) back in his home town from where he grew up and slowly introduces him to the HT version of Islam. “kill the kufaar” “you’re gonna burn in Hell” – that type of Islam if you know what i mean. Throughout the programme the 17-year-old is shown as a reluctant and often times subdued teen who is dragged into the heated demonstrations, the american flag burning demos which the producer’s brother (saladin) takes him to. Also throughout the programme the producer/camera man is trying to come to terms with the dramatic change of his step brother (riche). With whom only few years ago he was very close. This notion is fed to the audience throughout the programme with the producer constantly referring to his step brother by the former name (riche) as opposed to his new name Saladin. To sum up, all i can say is i feel sorry and saddened. Sorry for the new “naive” muslims like that of Saladin and the 17-year-old as well as the producer and non muslim audience who would or have viewed the programme already. Sorry, for Saladin that he has been dragged into basically of a version of Islam which is alien to the majority of muslims who live and contribute positively to the society. i feel sorry and saddened because their naivety may one day even lead them back to rejecting the path of Islam and revert back to their former ways. simply because they have left one extremism for another extremism. two wrongs don’t make a write as they say. Because this extreme attitudes of “you KUFAAR will burn in hell” and “Islam will dominate the world” is counter productive for dawah. It does more damage than good. As you simply push people away from Islam rather than bring them into it. I’m sure many people after watching the programme just have sealed their stereotypical view of Islam even firmer now than they had before. This hate filled preaching only serves to justify their stereotypical claims of “terrorist” “backward and evil muslims”. The programme also does justis to that negative view. As the families of these two new muslims are finding it increasingly had to live with the knowledge that their sons have become extreme. Now, the unfortunate families of these two Muslims (Saladin and the 17-year-old) would never see Islam maybe as others may do sometime down in their lives. They will only see the extreme ‘jihadi’ type of Islam. Simply because of their personal experiences. Now the prophet (sallahu’alihi’wasalam) never taught this. To do dawah harshly, condemning everyone to hell saying “if you don’t convert you are going to hell” no! He taught us to do dawah kindly, in a nice manner, and approach the non Muslims in a manner they feel attracted to Islam with wisdom and good preaching that they can relate to, rather than want to see the back of Islam. One other thing i noticed about the ‘new’ muslims is that they tend to after a period of time depending on each individual, can slip back to their former life style. As when the pull for the “good times” comes it can be unbearable leading them back to where they came from. to the ways of music, for instance. A few months ago i wrote this article of why celebrity Muslims tend to go back to music. after shunning it for a long while. You see, extremism in anything is not a good thing, even in Islam. The prophet (sallahu’alihi’wasalam) also taught us this when three companions came and the first one said i will never marry (i.e have relations with his wife), the second said i will never sleep (i.e do worship all night) whilst the third said i will never eat (i.e will fast all the time). The prophet after hearing of this news called them back and reprimanded them, and said to the nearest meaning, wording and effect that “i am the most knowledgeable one amongst you of Allah, i fast and i break my fast. i have relations and i sleep and wake up”. That it to say adopt the middle path. Otherwise what can happen is we can flip to the other side of what we are trying to save our selves of because of the extremes we have gone to, our nafs can one day just do a u turn, literally. one last thing i also find it strange how to media have slowly managed to attach the word Islam to fundamentalism/extremism etc. with the new word ‘Islamism’. As if to paint the whole of Islam an extreme! Previous PostGaddafi the new version of Yazid?Next PostWheelie bin babies! I don’t know whether you agree but I honestly don’t think the producer/camera man was looking for sensation. I think it was a genuine attempt to understand his brother and his ‘new’ faith. I don’t know what the media has done but anti-Muslim/anti-Islam is not the message of this documentary. I am glad that you have pointed out the message about the middle path. I was born into a Hindu-Buddhist family in India. During the partition in the 1940s, half of the family converted to Islam and stayed behind in Bangladesh. The other half moved to India. I went to Catholic school for 12 years. For me, as an a-religious (not adhering to one particular religion but having sympathy and understanding for all religions), the middle path is what people need to strive for. If everyone accepts that people might have different beliefs but agree to live harmoniously, humankind can call ourselves just and truly worthy. Till then, we can keep trying.